Dolls are always welcomed in any forms. The cloth and wire dolls of Karnataka are extremely traditional and a perfect piece of art by the local artists. 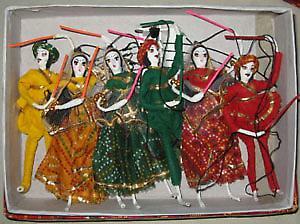 These dolls covey the traditions of Karnataka and also some of the figures are of Indian legends. Dolls are made in many different patterns, such as wire dolls, soft dolls, cone dolls and stuffed dolls. Artist first very carefully bent the wire to form the frame of the proposed doll and the figure is wrapped tightly in cloth and stitched into a 'skin' of brown poplin cloth. Designing and decoration is done once the main dress is put on the skeleton.Their hair and make is done very carefully as tese things enhances the beauty of the dolls.